A few months ago my husband David and I sat with our friend Thomas after Sunday lunch at our house. Thomas is our worship leader and takes his role very seriously. He spoke about Paul’s exhortation in Ephesians to speak to one another in “psalms, hymns, and spiritual songs.” At our church, which is a revitalization — merging a new church plant team with an older congregation — we seem to have an abundance of the second two categories. Hymns? Yep. Every self-respecting Baptist should have more than a few favorites of those. Spiritual songs? OK, we’ve got those too, thanks to the recent decade’s advent of worship bands producing a steady stream of albums. But how many psalms do we sing? We’ve been given an entire book of them in the Old Testament. How often do we sing those — and sing them to one another? The Psalms were Israel’s “hymnbook.” Certain psalms were dedicated to festivals, days of celebration, or occasions for mourning. But in recent years, Christian music seems to have veered away from this portion of Scripture in favor of original lyrics. Sandra McCracken’s release from last year is a nice exception. I’d like to introduce you to another. 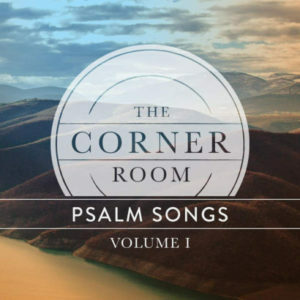 The Corner Room, a music ministry of Cahaba Park Church in Birmingham, Alabama recently released their first album of “Psalms Songs.” The songs on the album provide rich compositions of word-for-word English Standard Version psalms. Yes, this music is intended to help you recite and memorize Scripture. No, it’s not sing-songy or annoying in any way. As with our buddy Randall Goodgame’s Slugs and Bugs albums, the memorization happens quite naturally because of the excellence of the music. I’m so grateful when Christians don’t sacrifice good art for the sake of an additional purpose, like hiding God’s word in my heart. Corner Room has a warm, folk-rock sound heavy on guitars with strings and piano here and there. They reminded me a little of Mumford and Sons, with heavy bluegrass influences. It’s music that you can turn up and sing along to in the car, but also turn down and play during mealtimes. Additionally, the music has spawned some lovely visual art, which you can see at Corner Room’s website. I especially liked the video for Psalm 23 (the second video below), which features a curly-headed boy in his pajamas breezing in and out of the frame — and occasionally jumping on the couch — while his mom paints. It’s a good picture of beauty in the everyday, set to Biblical, poetic music. I’m excited to add this album to our household soundtrack. Get yourself a copy today and enjoy! You’re the second person I’ve seen talking about this. The other was the friend who turned me on to AP’s music. Guess I know what to do next. I’m late to the party here, but I’m glad to see that more people are turning to psalm singing. It doesn’t have be an exclusive sort of thing for churches, but I find it adds a lot of depth to worship. I’ve been using the iOS version of “The Book of Psalms for Worship,” and it’s pretty awesome even if you can’t read music all that well (and I can’t).